Books of hours are some of the most beautiful of illuminated manuscripts. Books of hours (or primers) contained prayers intended to be read at various times throughout the day. These times are known as the canonical hours, and include matins, lauds and vespers. Books of hours often also included religious calendars showing the saints’ days. The more important religious dates were commonly written in red ink, giving us the saying ‘red letter day’. This book of hours was produced in the late 15th century in the workshop of Jean Colombe of Bourges. 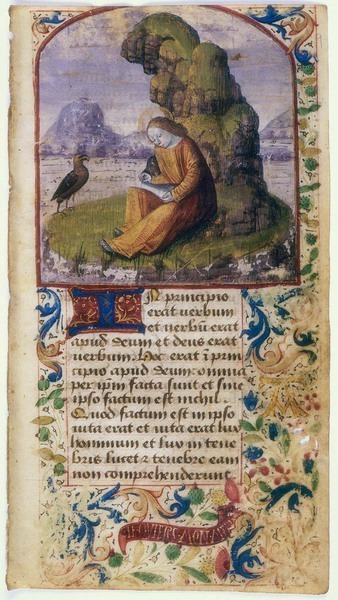 The text is Latin, with a calendar in French. The content includes a calendar; gospel sequences; O intemerata; Hours of the Virgin; seasonal variations; Hours of the Cross; Hours of the Holy Ghost; penitential psalms; litany; Vigils of the Dead; commemorations of saints; Stabat Mater. The illuminated decoration includes historiated initials (large decorated initial letters with small images inside them), miniature paintings and decorative borders of acanthus leaves, flowers and berries. The Bourges book of hours was acquired by the State Library in 1918.